Elixir newsletter – thank you for signing up! A 16-year-old study of older adults has revealed that those with higher blood levels of omega-3 polyunsaturated acids had a lower risk of dying. Omega-3 fatty acids are abundant in oily fish, such as salmon, sardines and mackerel, have already been linked to a number of health benefits, including a lower risk of cardiovascular disease. The study included 2,692 US men and women aged 65 years or older who took part in the Cardiovascular Health Study between 1989 and 1993. 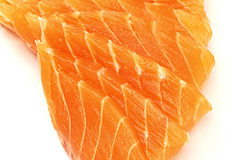 Researchers questioned them about their eicosapentaenoic acid (EPA) and docosahexaenoic acid (DHA) intake. Blood samples obtained during 1992-1993 were also analysed for plasma phospholipid EPA, DHA and docosapentaenoic acid (DPA). Over sixteen years of follow-up, 1,625 deaths occurred, including 359 caused by coronary heart disease (CHD) and 130 resulting from stroke. But the men and women whose total omega-3 fatty acids were among the top one-fifth of participants had a 27% lower risk of dying than those whose levels were among the lowest fifth. When omega-3 fatty acids were individually analysed, those among the top fifth of EPA, DPA and DHA levels were found to have a 17%, 23% and 20% lower risk. The risk of dying of heart disease was 35% less among those whose total omega-3 levels were highest, and arrhythmic cardiac deaths were lowered by 48%. On average, having an omega-3 fatty acid level among the top fifth conferred 2.2 extra years of life in comparison with whose level was lowest. When the relationship between omega-3 fatty acid intake and plasma levels was examined, the largest effect was seen with an intake of up to 400 milligrams per day. 1. Thinly slice the vegetables and chop up the herbs. Place them into a large bowl with 2 tbsp olive oil, lemon juice and seasoning. Allow to marinate for 1 hour. 2. Heat the remaining olive oil and pan-fry the salmon steaks on high heat for about 2-6 minutes each side or until crispy brown. 3. Put the salmon onto 4 hot serving plates served with the marinated vegetables. 4. Garnish with lemon wedges and sprigs of dill. Replace the salmon with cod steaks or other seasonal fish. This dish takes only a few minutes but its low calorie, delicious and packed with anti-aging nutrients. These can be served hot, straight from the barbecue, or do as the eastern Mediterraneans do, which is just as delicious, and let them cool in their packages and then serve them cold. 1. Thinly slice the leeks, place in a large sieve and rinse under cold water to remove any grit. Drain well. then divide the leeks, placing in the centre of piece of foil. Scatter half of the coriander over. Place a salmon fillet on top of each, season. 3. Mix together the remaining oil, curry powder and lemon juice and pour some over each steak, allowing it to drizzle over the fish onto the bed of leeks. Season with salt and freshly ground black pepper, then fold the foil over and seal the packages. 4. Put the packages on the grilling rack of a preheated barbecue and cook for 15 minutes. Halfway, place the stems of vine tomatoes on the barbecue and cook alongside the salmon (cooking time will depend on the temperature of barbecue and whether the barbecue is used open, which will take slightly longer than with a lid). To cook the salmon parcels in the oven, heat the oven to 200C/400F/gas mark 8. Place the parcels on a baking tray and cook for 15 minutes. Unwrap one parcel and test the fish is cooked using the point of a knife. 5. Remove the packages and either serve immediately, in or out of the foil. Scatter the remaining chopped coriander over the fish and serve with the tomatoes to accompany. Alternatively, allow to cool, then remove the wrappings and serve cold. Sugar substitute recipes don’t have to be boring – Canderel shows you how. Grind the spices (black peppercorns, rock salt, coriander seeds, ground all spice and ground cinnamon) in a pestle and mortar or small food mill. Make 4 to 5 slits into the skin of the duck breasts and rub the spices all over. Heat a large griddle or frying pan and cook the duck breasts skin side down for 4-5 minutes, then draining off any excess fat, turn the breasts and cook for a further 4-5 minutes according to thickness, allow a little longer if you like the meat well cooked. Allow to rest in a warm place for 2-3 minutes. Meanwhile to make the sauce, add Canderel, wine, zest and juice of orange, cranberries and cranberry jelly to saucepan and simmer for 10 minutes until thickened and syrupy. Slice the duck breasts diagonally and serve with red cabbage (see next recipe) on a bed of sweet potato mash drizzled with the sauce. Place the salmon in the teriyaki marinade for 10 minutes. Turn occasionally. Drain salmon, reserve the marinade. 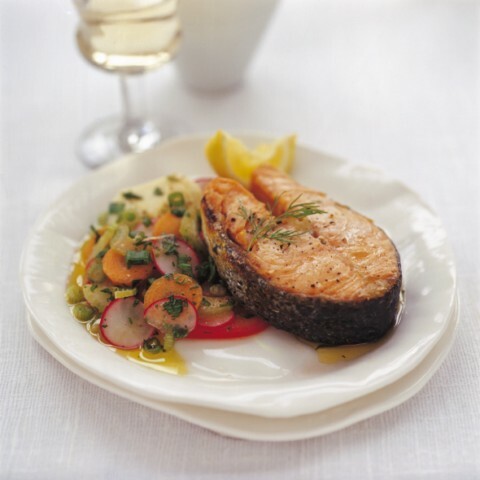 Cook the salmon in a heated oiled pan, brushing occasionally with the marinade, until cooked as desired. Bring the reserved marinade to a boil in a small pan. Reduce heat & simmer until the sauce thickens slightly. Add Canderel once heated. Serve salmon with pak choy, noodles & a drizzle of teriyaki sauce. Alternatively substitute the salmon for chicken breast or strips of sirloin beef. stalks with a rolling pin to flatten slightly, then very finely chop. chicken is browned. Add chopped lemongrass and the remaining ingredients (except the mangetout and coriander) and bring to the boil. Reduce the heat to a simmer for 15 minutes. Sprinkle over the mangetout and simmer for a further 5 minutes or until the sweet potatoes are tender.